After a growing season that witnessed extraordinarily variable weather, harvest is gradually getting underway in the Côte d’Or. It is an early harvest, about three weeks earlier than last year, mainly thanks to the summer-like weather experienced in April. This continued through May and into June, with the mercury creeping towards a furnace-like 40ºC at times, leaving the ground parched and the vines badly in need of a drink. Which they certainly got in July, when the temperature plummeted and the rain came down, and down. 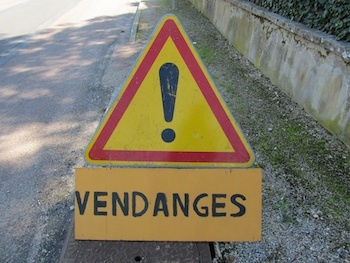 Drive carefully through the wine villages this week. Things got back on a reasonably even keel in August and today, in glorious sunshine, some more domaines, such as Bruno Colin in Chassagne-Montrachet, have started picking. Most domaines still harvest by hand (though you will see more machine harvesters than you might expect) and these teams of workers, often the same people from year to year, work up gigantic appetites after a backbreaking morning in the vineyards. Some domaines employ a chef for the duration of the harvest and the resultant fare can be excellent. A typical lunch for 60 people at Domaine Dujac in Morey-St-Denis last year ran thus: pasta salad, confit tomatoes with olives and pesto, chicken breasts in tarragon sauce with mushrooms, fromage blanc, peach crumble. Others provide a simple pack lunch, yet others offer a lunch allowance, called a prime pannier. 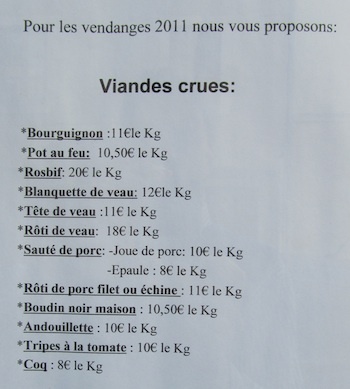 A further alternative is for the winemaker to call to his local butcher and stock up on a range of ready made dishes, on offer for the duration of the harvest, such as Boeuf Bourgignon for €11 per kilo, Tête de Veau for the same price or, for one euro less, Tripe à la Tomate. Burgundy is not called ‘the belly of France’ for nothing. Spotted in the butcher’s window in Santenay this morning.